Hello lovely Society Sisters! I have another post for you today, five new shades from Colores de Carol! First is the Mother Earth trio which consists of three unique and pretty glitter crellies. The Mother's Day duo consists of two soft, muted holographics. Let's take a look..
Hello lovelies! I have really liked the collections that Essie has made this past year. This Spring collection was no exception so I bought all six shades. The formulas were all nice and although not every one flattered me personally, I think they're all pretty in their own way. Let's take a look..
Hello lovelies! I have six new shades from Sally Hansen in their Mega Strength line to share, as well as a base and top coat. The colors all applied well with really nice formulas. I don't test out polishes for wear time or strengthening claims so I don't have much to say about that. However I did experience the top coat picking up the reds on the brush which was kind of a pain. I personally prefer fast dry top coats that are thicker and float over color better. Let's get to the swatches..
Hello lovely Society Sisters! How was your weekend? Mine was great but now that's it's Monday I feel so ill prepared for the week. 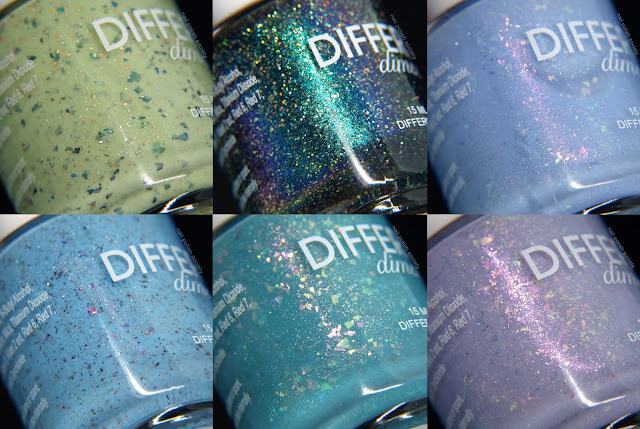 But I have pretty polishes to look at, so oh well! China Glaze's The Arrangement Collection consists of twelve shades of various finishes. I found the shade choices so interesting because there is a pretty good mix with many of them being not at all what you would expect for Spring. Maybe the goal was to appeal to people in both hemispheres? The downside was that most of the creme shades were more jelly like and very sheer. Color wise though, there are some very pretty selections! Hello lovelies! I am running on fumes right now so forgive me if any of this sounds like gibberish. 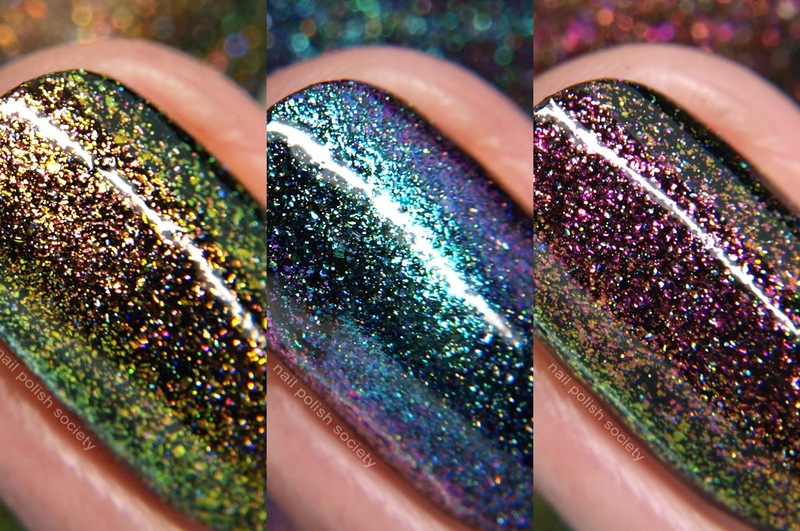 I have a gorgeous magnetic flaky trio from KBShimmer to share with you! Magnetic polishes can be hit or miss with me. I wasn't able to get a visible effect with these, but it does make a subtle transformation. I've seen many other swatchers able to get the effect so it must just be a problem of mine. Either way, these are just stunning. 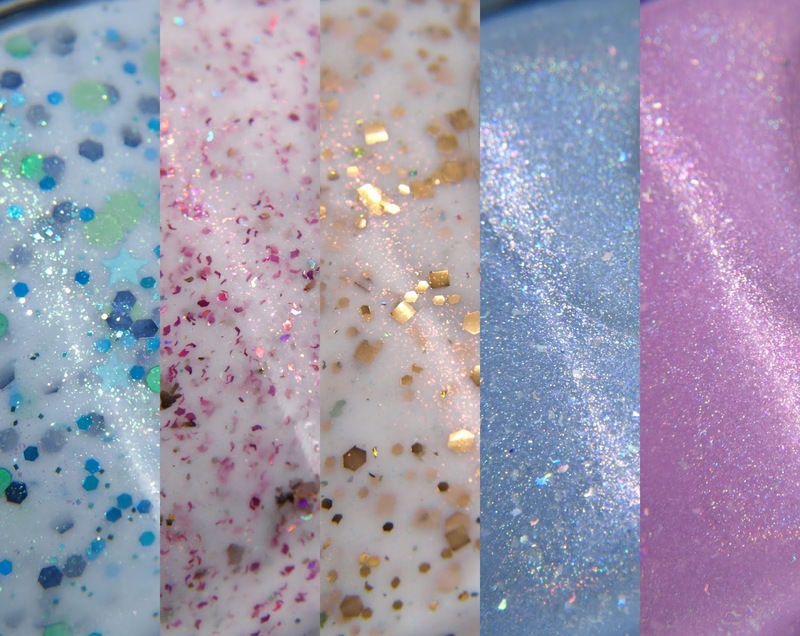 "One year ago, KBShimmer took a leap forward and launched a new look to celebrate the anniversary of our 10th year in business! We debuted our new logo and packaging featuring holographic accents by bringing you Launch Party, a beautiful magnetic space-themed collection! Now, we celebrate the one year anniversary of KBShimmer's new look - which we love even more today! - by bringing you a new magnetic top coat trio! This trio features magnetic multichrome flakes and vibrant micro holo flakes for a celestial look that is out of this world! Best worn over black or other dark colors when used with a strong magnet, this trio can also be worn alone in 2-3 coats when not magnetized for a unique multichrome finish."